Hi there! So you are looking for Benchmark Email Alternative! Email templates designed by Benchmark takes a lot of time to load. Benchmark does not provide with enough feedback as compared to other email marketing tools. In short, it has a weak support system. Also, pricing is one such major issues that may refrain one from choosing Benchmark Email. There are so many alternatives available for email marketing services which will definitely provide the best options as compared to Benchmark emailing. In this blog, you will find Benchmark alternatives which are free from these flaws. The services in this blog are tested and verified by professional email marketers. So, you can stay assured and trust ours handpicks. We hope all the information on this blog will help you to choose the best software and make your email marketing go easy and efficient. 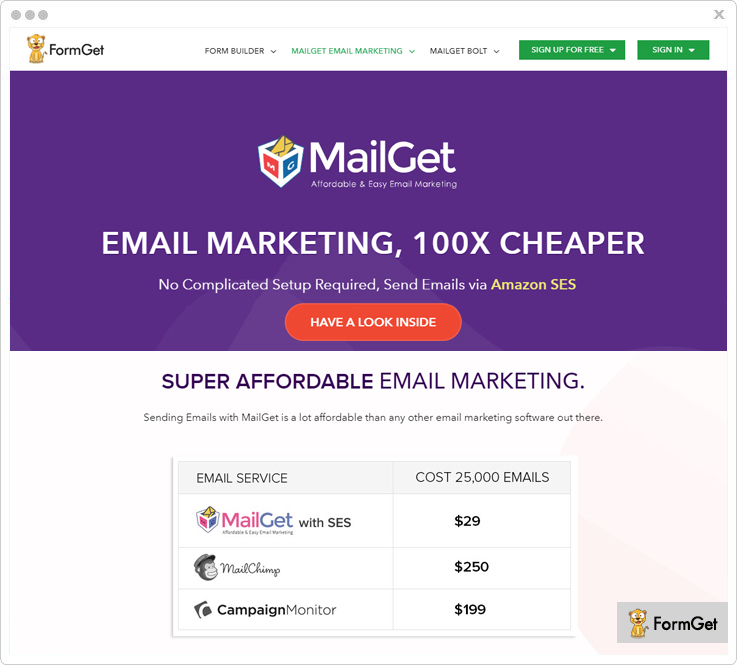 MailGet Bolt is an email marketing platform which is designed to send emails in bulk. It is an affordable Benchmark Email Alternatives because it provides us with easy, best, & quick email services. In order to give best email deliverability and higher open rate, MailGet Bolt uses exemplary several features like list management, email scheduling and so on. Further provides us with the functionality to integrate with other Apps like Google forms, Formlets, FormGet via Zapier which will help your business to grow further. Lastly, it is simple to set up and doesn’t require any technical or programming knowledge. 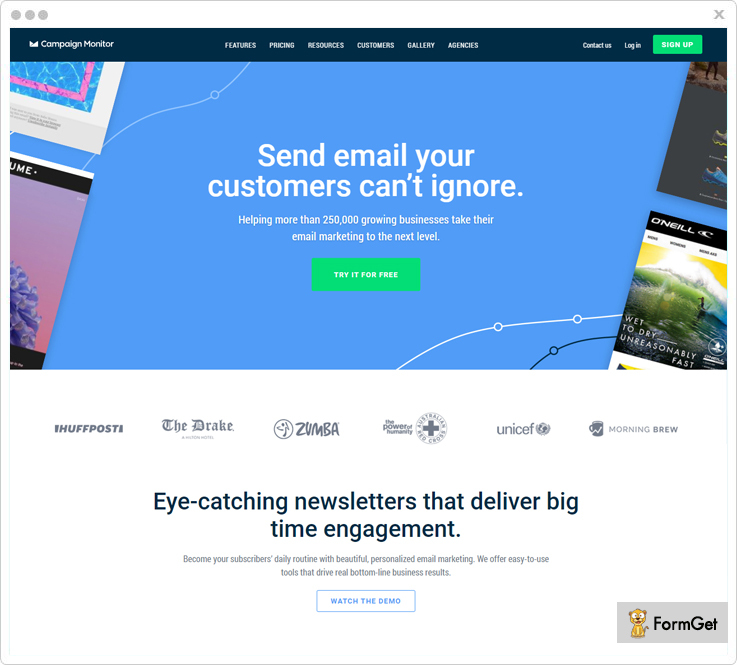 Drag and drop email builder makes eye catchy email templates which can be made in a few minutes. The layout of these email templates easily opens in mobile, IPAD as the email templates created using MailGet Bolt are completely responsive in nature. Email Inbox Preview help you to see the preview of your email before sending it to the customers this will help you to increase response rate. List cleaning will provide you to clean your unwanted emails and message addresses from the contact list so that delivery rate and subscription rate increase. Drip email is a series of emails that are sent to the customer automatically on a scheduled date and time. In Starters plan, you can send email to 2500 subscribers for $9 per month. Under the Rookie plan, email can be easily sent to 5000 subscribers for $19 per month. Pro plan costs you $34 for a month and allows to send emails to 10000 subscribers. The advance plan will charge you $49 per month for sending email to 15000 subscribers. 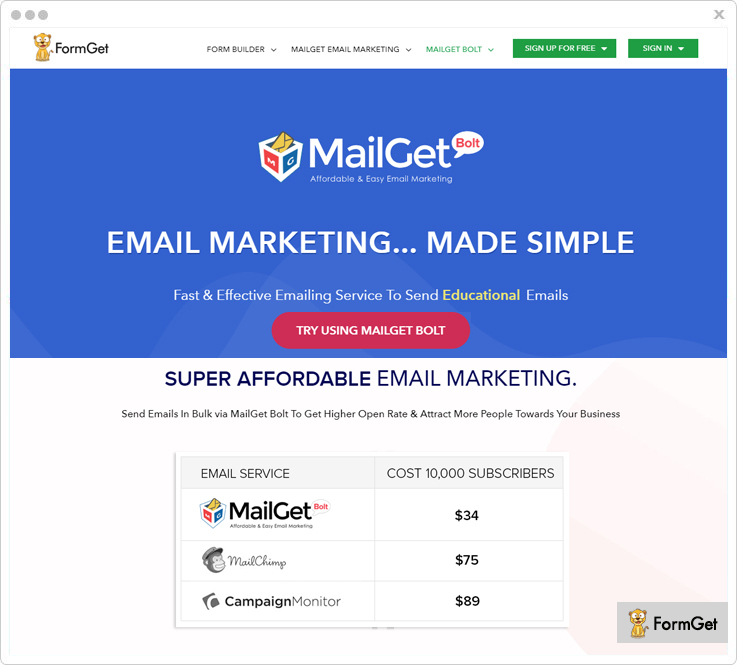 MailGet is simple and reliable email marketing software that helps you in creating beautiful email templates in a breeze. Interestingly, MailGet has so many features like email scheduling, email tracking, and so on. It also provides us with the feature of Autoresponder in which automatically generated replies are sent to the customer. For example, if a new contact appears in your email list then automatic welcome emails are sent using Autoresponder. Further, it is also 100 times cheaper than other email marketing software & its set up is very easy and accessible. Moreover, MailGet also connects with 50+ SMTP for example Postmark, Mandrill, Dyn, Spark post, and Amazon SES etc. MailGet is the only tool which resolves the problem of spam and bounce created by SMTP. Adding multiple SMTP help to send your emails to the customer and increase sending deliverability when there are so many senders. With the unsubscribe button any customer can remove himself from your email marketing list and hence your customer will never receive any mail in future. You can add a subscription form to your website and also share a link of your forms on the social media to collect leads. Google Analytics integration help to analyze from where traffic comes to your site, how subscriber uses your website and you can also track your website performance. Starters plan of MailGet allows sending emails to 5000 subscribers for $5 per month. For Rookie plan $29 is required to send email to 25,000 subscribers per month. In the Pro plan, you have to pay $49/m to send email to 50,000 subscribers. Advance plan used to send emails to 100,000 subscribers, for this you would be charged $79 per month. 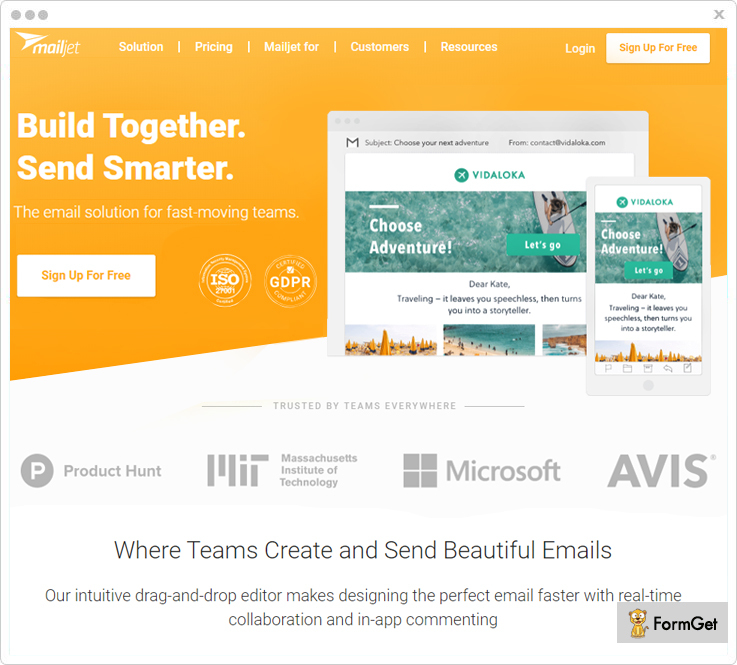 Mailjet is a handy solution for the fast-moving team, as it works on the mails as a squad. Using its email builder, you can easily create beautiful emails and send to the users. In fact, as compared to other email marketing, Mailjet provide us high deliverability and sending speed. Further, it helps to send the right message to the right person at the right time by the scheduling feature. It also has subscription forms which can be added to your website and also share a link of your forms on the social media to collect leads. While there are 7 data centers of Mailjet which are located in France, UK, US, Germany, and Belgium. MailGet also creates the workspace where team members are given specific role and permission regarding what they can access & operate. Contacts and segmentation collect data of the user and arranging them in the subgroups so that it makes simple to send the emails according to their response. Personalization creates mail by inserting users name in the emails which makes them feel how important they are. Email Tracking can easily track the send, clicked and opened rates of your campaigns. The free plan offers 6000 emails per month and allows to send 200 email in a day. The Basic plan contains all the essential features where you can send 30,000 emails per month for $8.04. Premium offers all the advanced features in which 30,000 emails are sent for $14.96 per month. Enterprises are dedicated to accounting management services and have customized solutions for high volume senders. For pricing information, you have to contact Mailjet sales team. 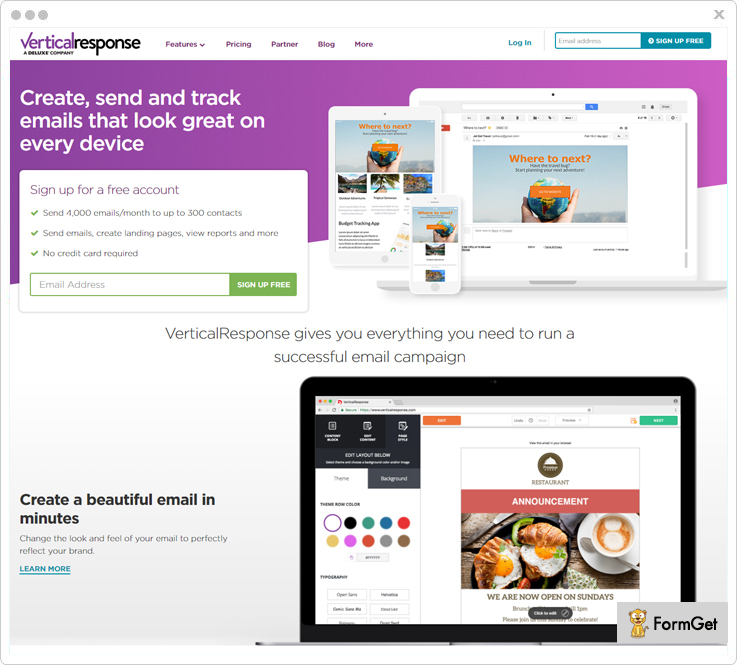 VerticalResponse is also one of the Benchmark Email Alternatives by which you can build, send and track send your emails within minutes, that will look amazing in all the devices. Also, it helps to build landing pages and view reports on every email sent. Moreover using VerticalResponse as Benchmark Email Alternatives we can easily make use of the editor in it. Also, you can send automatically generated emails to the customers if they missed their message. Then you can easily get the knowledge about the subscriber to whom you have sent the email. Like you can get information about their emailing device, Geolocation, country, IP and a lot more. By the A/B Testing you can easily determine which line of your subject is getting more results and catches the interest of your customer. Test kit helps you to know the preview of your mail before sending to the customer whether it will look exactly the same as you have designed. Survey features of VerticalResponse help you to develop mobile-friendly emails which will definitely open in other devices like IPAD and mobile etc. In VerticalResponse you have a feature to change the brand name of your email, you can also give some professional look to your brand name. Under the Free plan you can, send up to 4000 email per month to 300 contacts which will never expire. Basic is the best solution for businesses where one can send unlimited emails monthly for $11. Pro plan for businesses that need automation and advance campaign reporting and it will charge you $16 for a month. Pro+ would be charged $196 and perfect for those who need advance guidance. 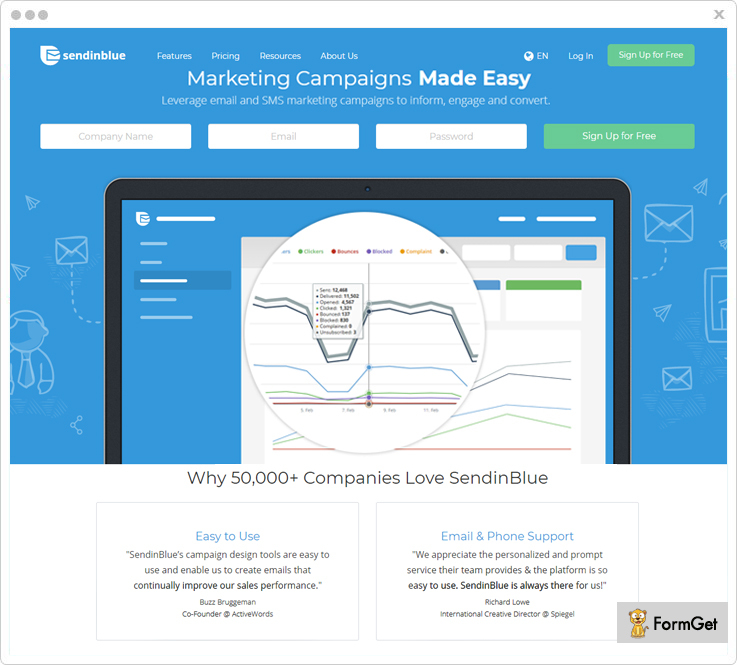 SendinBlue made marketing campaigns marketing automation transactional messages very easy. Further, it can be easily accessed because no logical coding is required. Also, it helps to create an attractive email through a drag and drop tool which is one of the most important aspects. It also provides you with a 24×7 customer support through the experts which will definitely help you regarding any type of queries related to emails like unsubscription link, tracking and so on. Meanwhile, its headquarters are located in the US, France, India. In SendinBlue report tracking tool will easily track click and open rate. In spam and inbox testing we first add contacts to the test list and send them a test email before sending to whole contacts list and after this, you can check whether email sent or becoming spam by the deliverability test. Deliverability checker in SendinBlue checks whether the email is sent to the customers’ inbox or not. Contact Management consist of 3 steps advanced search, list management, dynamic lists of which firstly customers are filtered, grouped and send automatically updated emails to the targeted customer’s list. In the Free plan, you can send 300 emails to unlimited contact in a day. Lite plan suit to new marketers who have just entered the market they can send 40,000 emails per month for $25. Essential fits for those businesses are growing can send 60,000 emails per month for $39. The premium plan is perfect for marketing pros where you can send per month 120,000 emails for $66. Enterprise is a custom plan where you can send 350,000 emails per month. 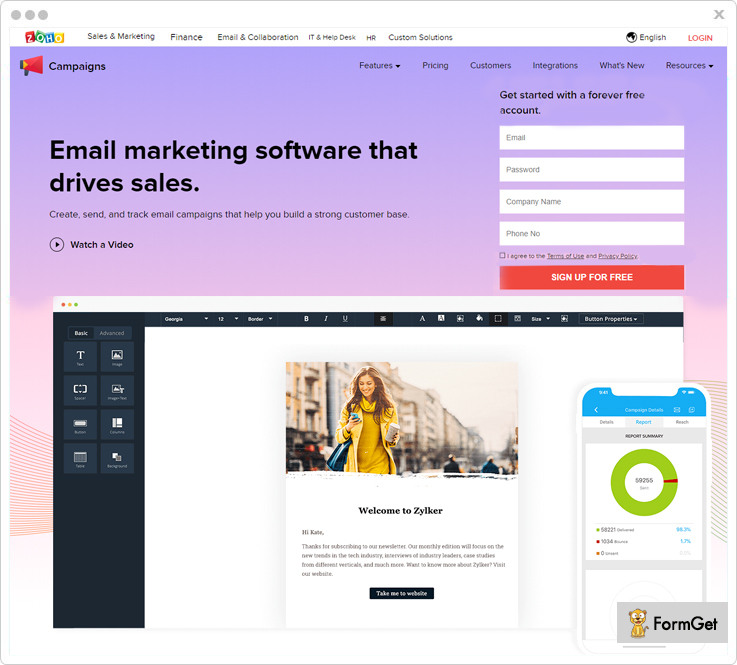 Campaign Monitor deliver emails that cannot be ignored by the customers because of their email builder tool that make an appealing email template which will look fabulous on each and every devices. Marketing Automation in Campaign Monitor design timely & applicable emails which are sent to the customer depending on their response to the first email. One of the most distinctive features of this BenchMark Email Alternative is that they have a personalized email sensor. If the email is opened by the subscriber they send more emails if not then they make more personalized emails. Further, it is highly efficient and profitable because It fabricates striking Newsletters that will help to consume customers time and make habitual of stunning emails. Around, 250,000 businesses trust Campaign Monitor to promote their products and services. You can set specific date and time for your email campaign by email scheduling feature. Apps and Integration absolutely join too many pre-built app and integrations so that you can connect to e-commerce platform or Websites. You can add Signup forms to capture more leads. these forms can be embedded or shared on the different websites. Marketing Automation feature helps to create “personalized customer journeys” by sending them emails which are well designed and when they needed it most. Basic plan provides all the core features and allows you to send emails to 2500 subscribers in a month at $9. Unlimited plan of Campaign Monitor allows sending unlimited emails at $29. Under the Premier plan, you will get all the advanced features and send unlimited emails by just paying $149/m. 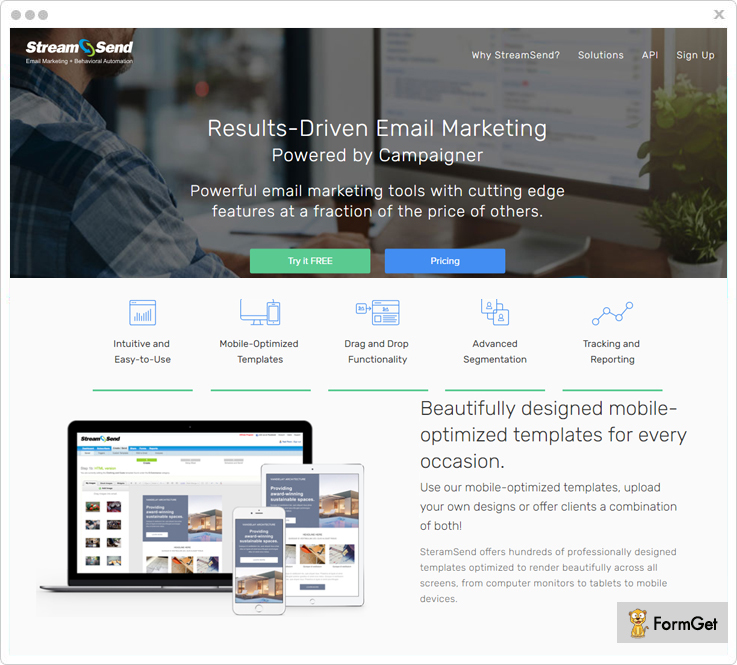 StreamSend provides a platform for powerful email marketing which will help small, medium and large businesses. In it, you’ll find an abundant number of pre-designed templates and a bulk of features. although, it also has a feature of tracking with which you can track your send emails, seen videos etc. Further, we see then it has proved its reliability to over 100,000 businesses like Hallmark, THOMSON REUTERS and many more. Email workflows automation feature make it easy to send emails to the targeted subscribers on the based on time, event and date. In bulletproof delivery, you can easily send emails to the subscribers no matter what type of services they use. Intuitive reporting keep tracking whether you stay on the top of your campaigns. Dynamic RSS by this feature software will generate automatic emails for your new blog. StreamSend introduces the plan where email can be sent to 25,000 contacts for $149 in a month. Another plan which costs you $299/m for sending emails to 50,000 subscribers. If you have a list of 100,000 contacts then you have to pay $549 for a single month. Zoho Campaigns can create, track and send email campaign that builds a brawny customer base. With this, you can target the audience, campaigns, and increase reach. Further, it also connects with other business applications like Facebook, YouTube, WordPress and many more to grow your business. Because it provides us with the functionality with which you may run your campaigns on the mobile devices. Meanwhile, the Zoho Campaigns, lets you make an easy analysis of the sent status, opened status, read status, of your emails. Also, you can create your own integrations using developer API and manage your mail list. Pre-designed Templates in Zoho emails provides us with the many of the templates on all the occasion that can be picked up and uploaded. If you want high leads then you can use consent management to keep data of your customer updated and manage to send the emails on the regular basis to those who show interest and when needed most. Email Policy will enable you to increase email deliverability, decrease the rate of email going in the spam. In Email based plans pricing is based on how much emails are sent. 1 – 500 emails are sent in $3. 501 – 1,000 emails are sent for $6 and so on. In Subscriber-based plans, pricing is based on the subscribers. Emails can be sent to the 1 – 500 subscribers in $5. Emails can be sent to the 501 – 1,000 subscribers in $10 and so on. Pay by Email credit pricing depends on email credits. 250 email credits in $6. 500 email credits in $12 and so on. 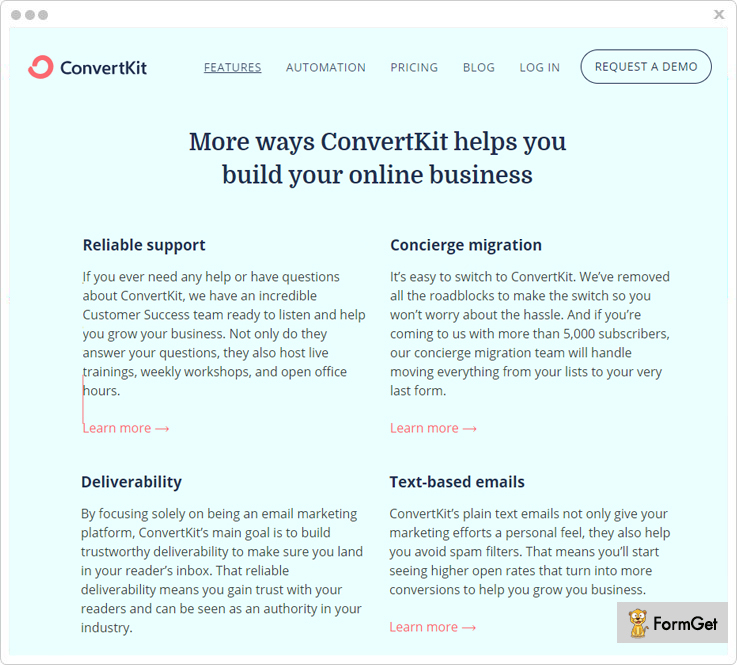 ConvertKit help to grow your online business by providing you the tools which are necessary to build an email template. However, it can be said that the email automation tool is very simple through which you can send targeted content at right time to the customer. Moreover, email tracking done in ConvertKit is easy and provide all the information related to open, click rates. Their integration partners are Instapage, SumoMe, Zapier etc. 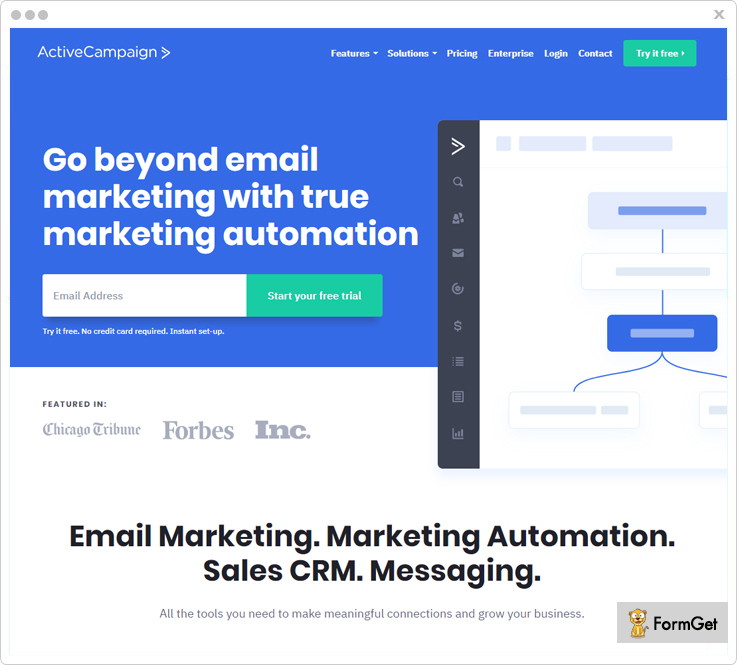 Meanwhile, startup companies in Email marketing can easily execute ConvertKit. If there is any problem regarding ConvertKit that will be resolved by the customer services support. Concierge Migration feature help to handle the hassles coming about switching the plans when subscriber increases simultaneously. Slack community by joining these ConvertKit people can easily connect with other users. Forms are ‘easy- to- embed’ through which user can easily send these forms to the subscriber & make them their regular customers. The starter plan of Convertkit will charge you $29.95/month where you can send emails up to 1000 subscribers. Next plan charges $49 in a month for sending email to the 3000 contacts. If you want to send email to 5000 subscribers, then you have to pay $79 in a month. ActiveCampaign provides all the tools which are necessary to create beautiful emails, that makes you feel personalized. Further, we move then we see that it also help to build a connection between customers & users by providing answers to the questions, asking for feedback and many more. although, it also having advance marketing automation as compare to other email marketing. Also, creates an awesome email marketing site with the feature of Newsletter and message targeted to each contacts interest. Dynamic content by this feature content will automatically vary customer to customer depending on the user’s interest. CRM & Sales keep the knowledge of all the leads collected and maintain all the backups of the contacts. You can create several splits on the basis of customers action by the split action feature. Attribution with marketing automation help to know about customers lifecycle. In the Lite, you can send emails to 1000 subscribers at $17/month. Plus plan has all the features of lite and some additional features like automation, custom branding and so on for $49. The professional plan gives unlimited email sending and many professional features for $129 per month. Under the Enterprise plan, you will get all additional features plus everything in professional at $229. As we come to the end of this Blog, you must have been able to compare the features and pricing of all the different software. Benchmark Email is a good email marketing software, however, it has a weak customer support and buffering issues. Luckily, we have discussed these Benchmark Email Alternatives that are a total package. Hope you found the best alternative!